An interesting gathering was held at St. Mark's Schools, Whitegate, on Saturday afternoon when the schools were handed over to the new parish by Mr. C. Holdsworth, J.P., on behalf of Messrs. Holdsworth & Co. There was a crowded attendance, presided over by the vicar, Rev. F.O. Warman, supported by Mr. C. Holdsworth, J.P., Mrs. Holdsworth, Mr. G.B. Holdsworth, J.P., Mr. & Mrs. J.W. Tillotson, Rev. E.W. Easton, Messrs. W. Taylor, E.G. Nightingale, E.W. Hinchliffe, W. Bagnall, S. Jackson, T. Brearley, L. Tattersall, A. Chadwick and F. Bradley. The Chairman referred to the long and valuable work of Mrs. Holdsworth in connection with her clothing club in the district, which has a membership of about 200. Her work in connection with the nurse for the parish was also greatly appreciated. There was no more blessed work than attending to the sick. He asked one of the oldest members of the clothing club to present Mrs. Holdsworth with a token of their affection. Mrs. Parker then handed to Mrs. Holdsworth a bouquet. Mrs. Holdsworth, accepting the gift, said if she could do anything to help any one in Siddal she would be glad to do so, especially if they showed a willingness to try and also help themselves. The Chairman read a letter from Mr. J.H. Howarth, J.P., who joined in sincere and grateful thanks to Messrs. Holdsworth. Messages of regret at inability to be present were also received from Rev. T. Rose-Price and Mr. J. Morton. 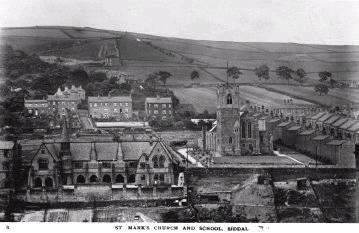 The Chairman recalled that the schools were built in 1874, at a cost of £4,000. When he came to the parish nearly 19 years ago, there was practically no church at Siddal, and if there had been no school it would have been very difficult to do anything. They had been fortunate in having the privilege of using those schools for many years. They had been a great blessing to the parish. Mr. Holdsworth had each year given them handsome prizes, which were valued by scholars in many a Siddal home. In connection with their schools there was a request by the late Mr. T. Holdsworth, who gave £120, which brought in about £4 per year. Since he had been at Siddal they had received about £70 in interest, which was a lesson on the value of bequests. Over the way they had a beautiful church, but it was only a baby, and would require providing for. They must try to keep it in a first-rate condition. If they had £1,000 left the interest would help towards the maintenance. The gift of the schools, the Chairman mentioned, was quite spontaneous. Mr. Nightingale mentioned that he had been in Halifax nearly 18 years, and Mr. Holdsworth was one of the managers of the Parish Church Schools when he was appointed headmaster. He mentioned that 195 boys of the Parish Church School voluntarily responded to the country's call, and their letters were an indication of the value of the religious instruction received. Mr. Tillotson alluded to the struggles of former days, and hoped the Vicar would interest the young people by giving them work to do. The church had never been refused help by Mr. and Mrs. Holdsworth. Mr. S. Jackson proposed thanks to Messrs. Holdsworth. Mr. F. Bradley seconded, and Mr. Taylor, supporting, said he had been a teacher there nearly 30 years. When he first went, Mr. Edward Parker was teacher of the second young men's class. Mr. Parker went to New Zealand as a lay reader, and a parish which he assisted to form was the farthest south in the world. The parish, he added, would not be complete until they had a vicarage. Mr. G.B. Holdsworth, J.P., replying, said his forbears had always taken an active interest in Siddal. It was his regret that he could not take a greater interest there, because he was interested in another church on Sundays. When they had got a vicarage all they would need would be a good recreation ground. That was a matter, however, which would have to be left for happier days. Thanks to the chairman were spoken by Mr. C. Holdsworth and Rev. E.W. Saston. The latter congratulated Mr. G.B. Holdsworth on his election as a West Riding magistrate. The Chairman expressed appreciation and thanks for all the kindness received whilst he had been at Siddal.